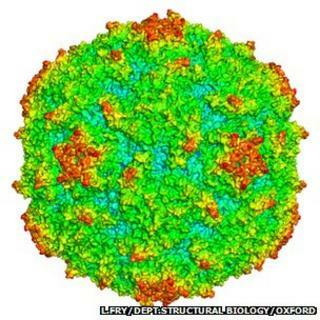 An international team of scientists is to try to develop a wholly artificial vaccine to combat polio. Media captionProf Dave Stuart: "We're not able at the moment to get rid of those last few cases"
"The idea of the synthetic vaccine is that it contains no genome - it's virus free," he told BBC News. "So it's made, in a way, like a super-chemical, a complicated chemical, that assembles itself to look like the virus but has no way of ever replicating." Prof Stuart explained: "There are problems because if you try to make something that looks like the virus but doesn’t contain the genome, it tends to be more fragile. "We had to use a detailed knowledge of how the atoms in this complicated structure were arranged to then go in and do some molecular re-engineering to make it more stable, so that it could hang around long enough to induce enough protective response from the immune system." "Our aspiration is eventually to get rid of the virus and consign it to a few vials in the freezers of the Centers for Disease Control and Prevention in Georgia, or wherever," said Prof Stuart. Other key British figures on the team are Prof Ian Jones from Reading University, Prof Dave Rowlands at the University of Leeds, and Dr Andy Macadam at the National Institute for Biological Standards and Control.